Some people love primers, some people hate them. I personally am a fan, especially if they actually do what they say on the packaging. No one's got time for false promises *eye roll*. For me, I normally want a primer to be pore-minimising or mattifying, but when it comes to the summer and my foundation doesn't already have SPF in it, I look to a primer to cover that as well. The one thing I find with products with SPF in them is that they can leave you a tad shiny. When I first received this I was slightly dubious about the 'oil control' claim but gave them the benefit of the doubt. I'm really glad I did, as this stuff works a treat. Even though it says it's formulated for oily, blemish-prone skin I found this was moisturising enough on my sensitive skin without drying it out. This gel-like formula is ideal for this time of year when it's hot outside but you don't want to go without your normal foundation. Any product I put on after goes on really well and this also contains sebum-regulating technology- perfect if you suffer from folliculitis like me. Before I tried this I had never heard of the brand Sunkissed before and was surprised to find that they are predominantly a tanning brand. This primer is unlike anything I've tried before- it comes out of the tube as a clear silicone-like gel but then melts like water into the skin. I haven't experienced any huge reductions in shine or pore-reduction but I have loved using it through these warmer months as it's light on the face and doesn't clog up my pores. As well being free from parabens and alcohol, this is also filled with Vitamin E which I have found has helped improve my skin's condition and texture. If you want to give a light base like a BB cream a little more longevity then this would be the perfect base to use. This is the primer that I currently have in my makeup bag and I'm seriously loving it! If you're not a fan of silicone based primers but want to reduce the look of your pores then this is definitely a good option. This applies as a light moisturiser and leaves the skin with a beautiful finish. I actually found that I didn't get as oily as I normally do when I applied this under foundation, even on really hot days. I would say it definitely reduces pores but not a huge amount. As it is a white cream, it doesn't conceal my pores as much as Benefit's Porefessional (scroll down to read more about this primer) so if you don't have a severe problem with enlarged pores then you'll love this. This primer has to be one of my all-time favourite primers. I first tried this when I received a tiny sample, and once I had used it up I knew I had a get a refill. 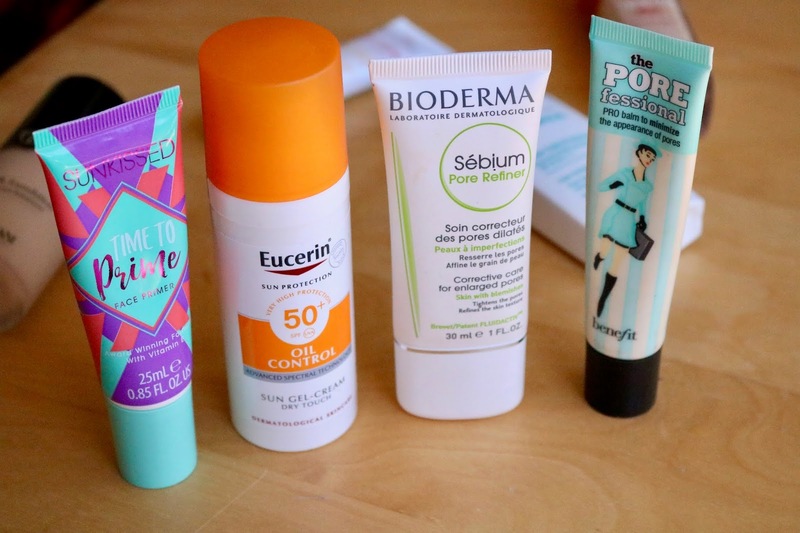 I only save this for special occasions or if my pores are causing me a bit of bother as it is more on the pricey side than some of the other primers featured in this post. I personally think it's worth every penny but I know it's not everyone's cup of tea. This silicone balm has a slight tint so as well as minimising the pores it also covers them. This is also great again at keeping any oil at bay throughout the day while treating the skin with Vitamin E.
As the summer months roll in and the temperatures rise (or in our case in the UK, stick around the mid to late 20's so we start complaining its too hot), I start to rotate my base products, normally reaching more for BB & CC creams as well as lighter foundations to see me through the days. This also counts for holidays too, as I normally will only apply one product onto my skin in the day to give me sun protection and a tiny bit of coverage. I'm still completely in love with my It Cosmetics CC cream which I featured in this post if you wanted to read what I thought about it. 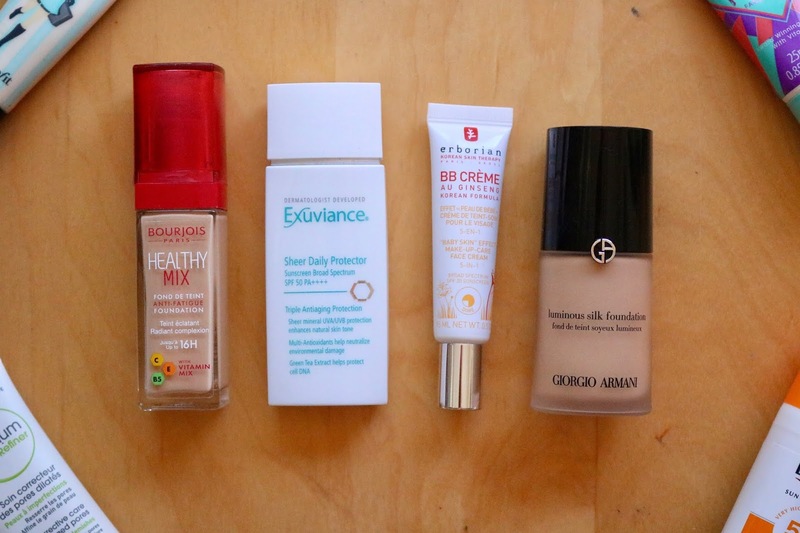 But here are some new discoveries and well-loved bases I've been reaching for. Let's start with an oldie but goodie. You need to believe the hype around this foundation as it really works wonders. I actually use this during the winter too but just in a slightly lighter shade. Whenever I apply this I know I'm going to get great coverage that is buildable, long-lasting and even moisturises my skin so I don't any crusting throughout the day. This has a bold statement of lasting for 16 hours and I would definitely say this is realistic. My base still looks great after a long day, and I think that's thanks partly to the vitamin mix of C, E and B5 in it that treats the skin while you wear it. This has been an old favourite of mine for a very long time, and it has come with me on all my travels abroad ever since I got my hands on it. I probably should have thrown it away by now as I've had it so long but I just can't bear to part with it. I have found this super effective at protecting my skin on holiday while giving it a hint of coverage to even out my skin tone. I pop this in my day bag to reapply while I'm out as it can be applied really easily with fingers without a mirror as it blends so easily into the skin. This is also one of the only products that doesn't give you that 'suncream sheen', meaning you can apply the rest of your makeup without worrying about being super pasty or shiny. As well as protecting against UVA and UVB rays, it also contains green tea extract to help protect cellular DNA. I hadn't realised that I was without a BB Cream in my collection until I received this one. 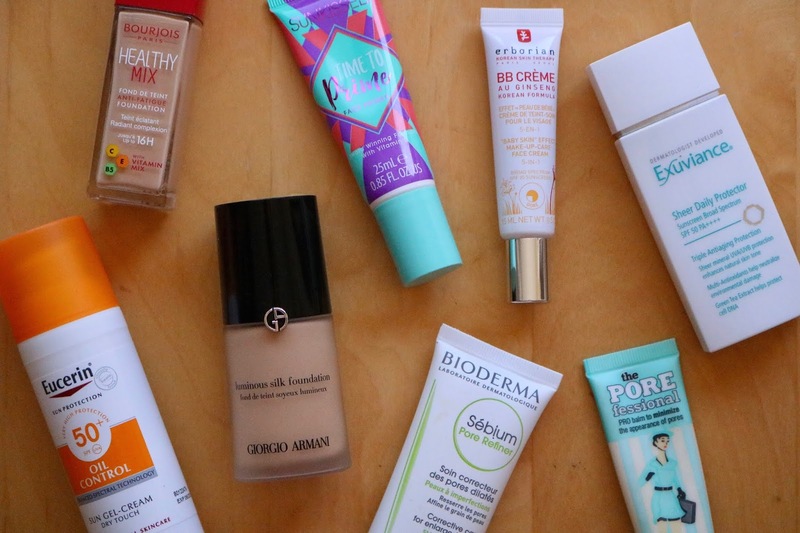 I'm a huge fan of BB creams but when I last ran out I completely forgot to restock! I have really been enjoying this one, even if the shade is a little dark for me. This has great coverage and is a little thicker than some of the other products I've talked about, so this will probably be great at complimenting your post-holiday tan when you return home. This has a lovely velvety finish that doesn't cling to any dry patches or imperfections and contains ginseng which is known for its hydrating and anti-ageing properties. Erborian is definitely a brand to watch out for as they are currently taking the beauty world by storm. Out of all of the above, this foundation has become one of my number one faves. Believe the hype around this one- this light to medium coverage allows the skin to breathe all while leaving the perfect dewy finish. I'm honestly obsessed with this foundation, and despite the price tag, this is seriously worth the money and more. This foundation gives me that 'your skin but better' look, and doesn't budge even on those hot humid days. I feel like this will work for both this time of year as a light coverage and during the winter with a couple more layers as it's so buildable. Tip: if you're heading away on holiday, be sure to stop by World Duty Free as you can pick this up for a fraction of the normal price! What are your favourite base products to use during the summer? I'd love to hear your suggestions of what I should try.